For additional information on warnings and indicators, see Vehicle information display later in this section. When the ignition switch is placed in the ON position, the Anti-lock Braking System (ABS) warning light illuminates and then turns off. This indicates the ABS is operational. If the ABS warning light illuminates while the engine is running, or while driving, it may indicate the ABS is not functioning properly. Have the system checked by a NISSAN dealer. If an ABS malfunction occurs, the anti-lock function is turned off. The brake system then operates normally, but without anti-lock assistance. See Brake system in the Starting and driving section. This light functions for both the parking brake and the foot brake systems. When the ignition switch is placed in the ON position, the light comes on when the parking brake is applied. When the ignition switch is placed in the ON position, the light warns of a low brake fluid level. 1. Check the brake fluid level. Add brake fluid as necessary. See Brake fluid in the Maintenance and do-it-yourself section of this manual. 2. If the brake fluid level is correct, have the warning system checked by a NISSAN dealer. - Your brake system may not be working properly if the warning light is on. Driving could be dangerous. If you judge it to be safe, drive carefully to the nearest service station for repairs. Otherwise, have your vehicle towed because driving it could be dangerous. - Pressing the brake pedal with the engine stopped and/or a low brake fluid level may increase your stopping distance and braking will require greater pedal effort as well as pedal travel. - If the brake fluid level is below the MINIMUM or MIN mark on the brake fluid reservoir, do not drive until the brake system has been checked at a NISSAN dealer. If this light comes on while the engine is running, it may indicate the charging system is not functioning properly. Turn the engine off and check the generator belt. If the belt is loose, broken, missing, or if the light remains on, see a NISSAN dealer immediately. - Do not ground electrical accessories directly to the battery terminal. Doing so will bypass the variable control system and the vehicle battery may not charge completely. Refer to Variable voltage control system in the Maintenance and do-it-yourself section later in this manual. - Do not continue driving if the generator belt is loose, broken or missing. This light warns of low engine oil pressure. If the light flickers or comes on during normal driving, pull off the road in a safe area, stop the engine immediately and call a NISSAN dealer or other authorized repair shop. The engine oil pressure warning light is not designed to indicate a low oil level. Use the dipstick to check the oil level. See Engine oil in the "Maintenance and do-it-yourself" section of this manual. Running the engine with the engine oil pressure warning light on could cause serious damage to the engine almost immediately. Such damage is not covered by warranty. Turn off the engine as soon as it is safe to do so. Your vehicle is equipped with a Tire Pressure Monitoring System (TPMS) that monitors the tire pressure of all tires except the spare. The low tire pressure warning light warns of low tire pressure or indicates that the TPMS is not functioning properly. After the ignition switch is placed in the ON position, this light illuminates for about 1 second and turns off. If the vehicle is being driven with low tire pressure, the warning light will illuminate. When the low tire pressure warning light illuminates, you should stop and adjust the tire pressure of all 4 tires to the recommended COLD tire pressure shown on the Tire and Loading Information label located in the drivers door opening. The low tire pressure warning light does not automatically turn off when the tire pressure is adjusted. After the tire is inflated to the recommended pressure, the vehicle must be driven at speeds above 16 MPH (25 km/h) to activate the TPMS and turn off the low tire pressure warning light. Use a tire pressure gauge to check the tire pressure. For additional information, see Tire Pressure Monitoring System (TPMS) in the Starting and driving section and in the In case of emergency section. If the TPMS is not functioning properly, the low tire pressure warning light will flash for approximately 1 minute when the ignition switch is placed in the ON position. The light will remain on after the 1 minute. Have the system checked by a NISSAN dealer. For additional information, see Tire Pressure Monitoring System (TPMS) in the Starting and driving section and Tire pressure in the Maintenance and do-it-yourself section in this manual. - If the light does not illuminate with the ignition switch in the ON position, have the vehicle checked by a NISSAN dealer as soon as possible. - If the light illuminates while driving, avoid sudden steering maneuvers or abrupt braking, reduce vehicle speed, pull off the road to a safe location and stop the vehicle as soon as possible. Driving with under-inflated tires may permanently damage the tires and increase the likelihood of tire failure. Serious vehicle damage could occur and may lead to an accident and could result in serious personal injury. Check the tire pressure for all four tires. Adjust the tire pressure to the recommended COLD tire pressure shown on the Tire and Loading Information label located in the drivers door opening to turn the low tire pressure warning light OFF. If the light still comes on while driving after adjusting the tire pressure, a tire may be flat. If you have a flat tire, replace it with a spare tire as soon as possible. - When a spare tire is mounted or a wheel is replaced, tire pressure will not be indicated, the TPMS will not function and the low tire pressure warning light will flash for approximately 1 minute. The light will remain on after 1 minute. Contact your NISSAN dealer as soon as possible for tire replacement and/or system resetting. - Replacing tires with those not originally specified by NISSAN could affect the proper operation of the TPMS. - The TPMS is not a substitute for the regular tire pressure check. Be sure to check the tire pressure regularly. - If the vehicle is being driven at speeds of less than 16 MPH (25 km/h), the TPMS may not operate correctly. - Be sure to install the specified size of tires to the 4 wheels correctly. This light comes on when various vehicle information display warnings appear. The Intelligent Key warning light warns of a malfunction with the electrical steering lock system (if so equipped) or the Intelligent Key system. After the ignition switch is placed in the ON position, this light comes on for about 2 seconds and then turns off. If the light comes on while the engine is stopped, it may not be possible to free the steering lock or to start the engine. If the light comes on while the engine is running, you can drive the vehicle. However, in these cases, contact a NISSAN dealer for repair as soon as possible. 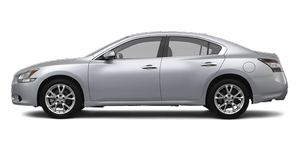 See "NISSAN Intelligent Key" in the "Predriving checks and adjustments" section. The light and chime remind you to fasten your seat belts. The light illuminates whenever the ignition switch is placed in the ON or START position and remains illuminated until the drivers seat belt is fastened. At the same time, the chime sounds for about 6 seconds unless the drivers seat belt is securely fastened. The seat belt warning light may also illuminate if the front passengers seat belt is not fastened when the front passengers seat is occupied. For 7 seconds after the ignition switch is placed in the ON position, the system does not activate the warning light for the front passenger. Refer to Seat belts in the SafetySeats, seat belts and supplemental restraint system section for precautions on seat belt usage. When the ignition switch is placed in the ON or START position, the supplemental air bag warning light illuminates for about 7 seconds and then turns off. This means the system is operational. - The supplemental air bag warning light remains on after approximately 7 seconds. - The supplemental air bag warning light flashes intermittently. - The supplemental air bag warning light does not come on at all. Unless checked and repaired, the supplemental restraint system (air bag system) and/or the pretensioners may not function properly. For additional details see Supplemental restraint system in the SafetySeats, seat belts and supplemental restraint system section of this manual. If the supplemental air bag warning light is on, it could mean that the front air bag, side air bag, curtain air bag systems and/or pretensioner systems will not operate in an accident. To help avoid injury to yourself or others, have your vehicle checked by a NISSAN dealer as soon as possible.